Health-Net: Symptoms of tonsillitis often appear to attack the children. The operation became a last resort to overcome them. However, there is now new ways tonsillectomy, tonsils removal with radio frequency. 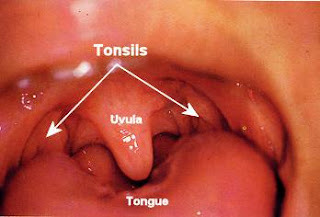 Tonsils or tonsillitis is a part of the lymph nodes are located on the right-left larynx. Although it can be suffered by anyone, most of the more experienced of the tonsils and adenoids of children aged five to 15 years. The emergence of this disease is quite disturbing patients, such as in children, which is annoying behavior, snoring during sleep, until heart failure. In addition, the symptoms of this disease in the form of throat felt dry, pain on swallowing, fever, sometimes followed by flu, colds, headaches, bad breath, nausea, and enlarged lymph nodes around the neck. Handling inflammation of the tonsils is very diverse. Start medicine therapy to raise tonsillitis tonsil removal as the final solution, he said in the event themed. Radio Frequency for Tonsillectomy, the modern handling of tonsils diseases. The method of overcoming the past to overcome inflammation of the tonsils, that is through surgical removal of tonsils. Operations to be one way for the case with tonsil infected and the growing size so that disrupt road and street respiratory eat. When the tonsils become a den of germs, the infection often recurs. Tonsillectomy is the most frequently performed surgery ENT specialist doctor. In the United States in 1985 reported an average of 350-400 thousand performs tonsillectomy. Currently, operations are supported by cutting-edge technologies and devices that reduce risk and so relieve the effects for the patient. Since the last decade, introduced a new way of using advanced technology in the surgical tonsils removal, which is using radio frequency techniques. The radio frequency energy is a device that uses low temperatures (40-70 degrees Celsius), in contrast to electrocute technique that uses energy to the temperature reached 400 degrees Celsius. Radio frequency using radio waves at frequencies from 1.5 to 4.5 MHz. The radio waves generated by the generator units will be streamed to the electrodes in contact with the organ to be operated. Radio energy will break the chemical bonds in the network, and ultimately result in cutting and freezing of tissue. Because this process occurs at low temperature, around the damaged tissue will be minimal. The category of chronic tonsillitis patients to undergo surgery using radio frequency that provides the comfort level far above the conventional surgical procedure, even with a faster recovery process. Based on research conducted in several countries, concluded that the use of radio frequencies in the tonsillectomy (tonsils removal) has several advantages, including shorter duration of surgery, less bleeding, and postoperative pain that is lighter because there is not an open surgical wound. Using radio frequency technology to tonsils removed is not only used for tonsillectomy. Radio frequencies can also be used for operations to address other issues surrounding the ear nose throat, including snoring and nose the enlarged (hypertrophy), which resulted in blockage of the nose.